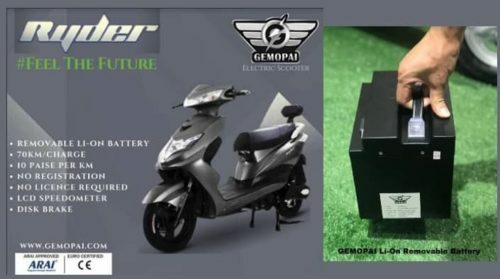 New Delhi, Delhi, India/News Voir//– Gemopai electric scooters, a joint venture between Goreen E-Mobility, an accredited Delhi-based electric mobility company founded in 2016, and Opai Electric, one of the largest manufacturers of electric two wheelers in the world, this week released their first removable lithium ion battery powered Electric Scooter Gemopai Ryder for the Indian market. Committed to being a leading provider for electric mobility throughout India today, Gemopai is drawing on the 15+ years of experience through its joint partners, who have sold more than 15 million electric 2-wheelers worldwide. Additionally, Goreen E-Mobility and Opai have signed MOU for joint venture technology transfer and cooperation agreements for further developing electric two wheeler models for the Indian market. All the models of Gemopai electric scooters will be manufactured in India at there new manufacturing facility in Greater Noida. Gemopai is also in talks with top technical institutes in India to conduct R&D for BMS & Smart Scooter Applications. “We believe that the future will be driven by electric mobility, and we want to be at the forefront right here in India, where millions of people, every single day, have little access to technologically advanced clean energy vehicles,” said Amit Raj Singh, Co-founder and Managing Director of Goreen E-Mobility. The new Gemopai Ryder runs a 70km/charge, is available in 5 colors, and comes with various accessories options for the Indian market. Gemopai plans to launch 2 more high speed electric scooters within the next 3-6 months. Additional scooter specs included in Gemopai’s mobility options are hydraulic suspensions, disk brakes, digital speedometer, LED headlight, keyless entry, anti-theft alarm and mobile USB charging with little to no service requirement for the expertly developed electric transportation solution. Gemopai has already opened a few dealerships in the country. They plan to continue expanding with dealerships throughout India, so individuals will have access to the green mobility options they desire across India.